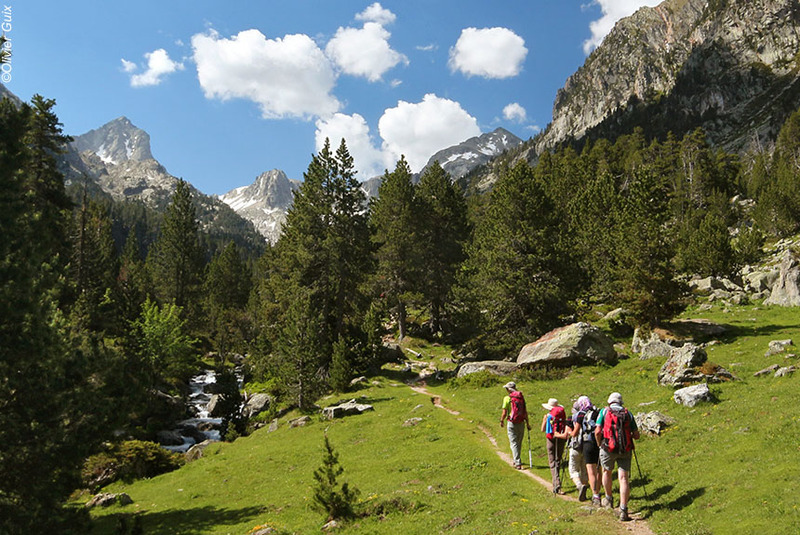 Walk the length of the Pyrenees, all the highlights on foot with private transfers in between. Quality, authentic accommodation. The Atlantic to the Med in 2 comfortable and rewarding weeks a walking holiday that is sure to create memories which you will always treasure. What an itinerary! What a memorable journey! Cross from the green Atlantic Basque Country to the blues of the Mediterranean, visiting all the most interesting highlights (often on the iconic GR10). Private transfers are included so you only walk the "best bits". You will experience everything from the magnificent grandeur of the UNESCO Cirque de Gavarnie, the delights of the Val d'Azun, the amazing Spanish Pyrenean lakeland, the largest canyon in Europe, the sunny Cerdagne plateau, and right through to the vineyards overlooking the Med. Every night you stay in comfortable, authentic hotels where good food comes as standard, and our 24/7 English speaking service is there if you ever need it. This journey includes daily private transfers and the price has to reflect this. We meet you at the airport or station at Biarritz for the short transfer to Saint-Jean-de-Luz. Pick-ups also available from Toulouse, Bordeaux or Pau (please consult us for prices). Saint-Jean-de-Luz is a wonderfully atmospheric and typically Basque fishing port - well worth exploring before and after dinner. You stay at the three star boutique Hôtel Les Almadies right in the historic centre of this small town, and we leave you free to enjoy whichever of the many portside restaurants takes your fancy - our recommendations are available too. The 3,000 foot La Rhune is a magnificent place to start your walk acreoss the Pyrenees. We transfer you to the historic rack railway that takes you gently, clatteringly and scenically to the top from where you can descend at your own speed among alpine pastures and beech woods. There is a choice of a longer route if you'd prefer it, but either way we transfer you to the ancient and atmospheric pilgrim citadel town of St Jean Pied de Port nestling beneath high mountain passes. You stay at the typically Basque two star Hôtel Ramuntcho facing the walls of the citadel, so ideal for wandering around on foot before dinner in a nearby restaurant- again a typically Basque experience we are sure you will enjoy. Walking time : 2h or 4h30. Descent: 800m. Transfers : 1h and 1h30. You begin today with a transfer up to the ski resort of La Pierre-St-Martin with its panoramic views, and walk, more down than up, following the route of the iconic GR10 footpath that crosses the Pyrenees from the Atlantic to the Med. You walk around the impressive Pic d'Anie (and its similarly impresive "sister" peaks) on a limestone plateau cut through with small canyons before reaching the gentler agricultural landscapes of the Apse valley, one of the most protected and delightful in the whole of the Pyrenees surrounded, as it is, by a stunning array of mountain peaks. Tonight you will be warmly welcomed at the Maison d'hôtes Pouquette by M and Mme Ziane at their rather well appointed ancient house right in the heart of an Apse valley village, and in our view by far the most memorable place to stay in the area. A good dinner to be enjoyed too! Walking time: 4h or 5h. Ascent/descent: + 350m / - 550 or 950m. Transfer: 1h45m. Several memorable highlights today. The Chemin de la Mature was cut into a sheer cliff face to enable timber to be brought down for use by the French navy (when they had wooden ships, of course! 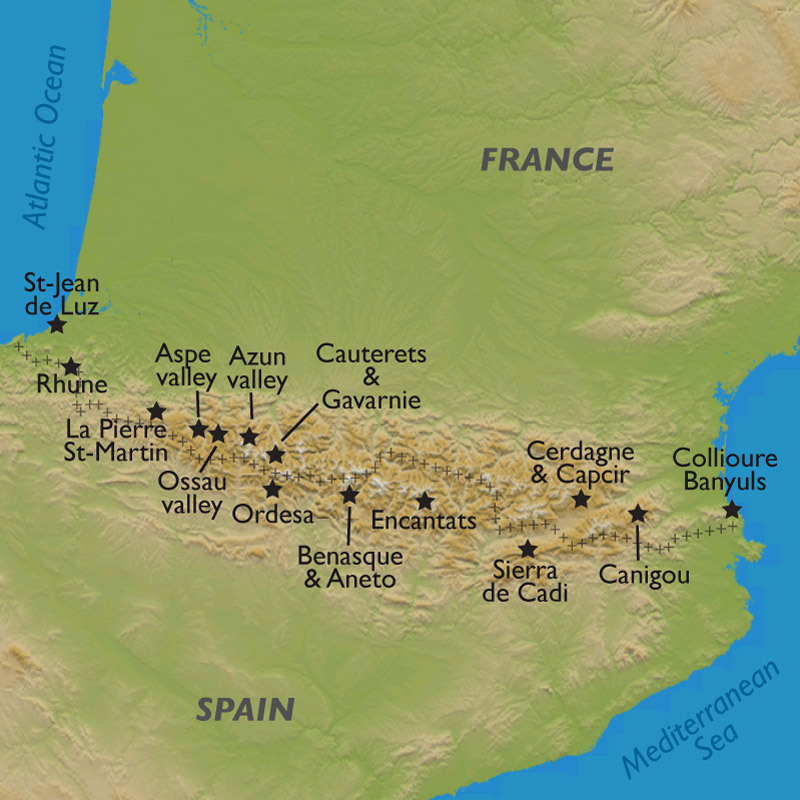 ), and is now a renowned (but perfectly safe) part of the Pyrenees National Park where you will spend today. The 4,000 feet high Bious Artigues lake is made all the more beautiful by reflecting the magnificent Pic du Midi d'Ossau (once a volcano) which towers above it. You stand a reasonable chance of seeing isards (Pyrenean mountain deer), and will certainly see Griffon vultures circling overhead. You can also enjoy strolling round other lakes in this wonderful area before being transferred up to your 6,000 feet high hotel - and what a hotel! The three star Hôtel du Pourtalet has superb views across to the Pic du Midi d'Ossau from its bedrooms and restaurant. Now in the hands of the 4th generation of the Casadebaig family, this is a thoroughly contemporary hotel with style and "class" offering an hospitable combination of tradition and innovation. Walking time : 3h30 or 5h. Ascent/descent : + 550 or 700m / - 550 or 700m. Transfer : 2h30m. We drive you up and over the Col d'Aubisque, so you can mainly walk high up along the magnificent GR10, initially among summer pastures with stunning views, then descending gradually down into the Azun valley with waves of mountains running seemingly endlessly eastward. You will pass the interesting, high altitude stone barns at Artigaux built for summer use, before walking along the valley with attractive, traditional stone-built villages and green fields. You may well be frequently distracted by the contrasting mountain peaks above. Maison d'hôtes Sempé is one of our favourite places to stay because the ancient house with its wood pannelled walls and creaking stairs is so atmospheric, because of the warm welcome from Sylvie and Jean-Paul and the conversations with them about the region, and because of the lovingly prepared home made food, often coming from the garden and foraging in season. See what you think. Walking time : 4h or 5h. Ascent/descent : + 230m or + 300m / - 830m or - 900m. Transfer: 1h. Your day begins with a transfer to the impressive waterfalls and ancient bridge called Pont d'Espagne from where you climb up to the lac de Gaube in which is reflected the imposing north face of Vignemale, the highest mountain in the French Pyrenees at 10,820 feet, which also has the largest glacier in the French Pyrenees. It's quite a sight reflected in the limpid waters of the lake. Take your time enjoying these simple but inspiring panoramas of this high, but not highly developed, area before descending comfortably back down to Pont d'Espagne (two different descent options). If you want to extend your walk, you can also keep going up along this marvellous valley until you come to the Refuge des Oulettes de Gaube, nestled right at the foot of Vignemale's north face - it's truly awe-inspiring! Now, the Hôtellerie du Pont d'Espagne is not a luxury hotel, but it is, all the same, a privileged place to stay because of tis location facing the ancient bridge and right by the wonderful waterfalls right in the middle of nowhere. We are confident you will enjoy it. Walking time : 2h or 6h. Ascent/descent : + 300 or 700m / - 250 or 650m. Transfer : 50mins. Today is Cirque de Gavarnie day, arguably the major highlight of the HIgh Pyrenees. You'll follow quiet wooded paths up onto the Plateau de Bellevue (it lives up to its name - there really is a "beautiful view"!) and then down into the magnificent almost circular crater with high waterfalls and 5,000 feet sheer cliffs. The French call it a giant's cauldron, and that's not a bad description because its scale makes you feel miniscule by comparison. However, the walking is surprisingly easy and enjoyable with good footpaths enabling you to explore it all, including walking right up to the highest waterfall in Europe - over 1,000 feet high. To get back to Gavarnie, you can either head there directly or take another amazing path, carved into a cliff face - well worth trying for the more daring among you! You stay at the excellent three star Hôtel La Brèche de Roland, the best in the area - well located, attractive, contemporary, hospitable, good food, and views up to the Brèche de Roland itself - located 9,000 feet up, it is a 300 feet wide gap in the mountain range said to have been cut by Durendal, the sword of Count Roland after his defeat in the 778 battle of Roncesvalles. Walking time : 5h or 6h. Ascent/descent : + 500 to 750m / - 500 to 750m. Transfer : 1h30. Tourmalet is a name that strikes fear into Tour de France cyclists, but for walkers it is a beautiful, dominant mountain pass standing guard over the numerous lakes that have made the Réserve Naturelle du Néouvielle renowned and much loved. Today, you will stroll past lakes like Coubous, and over the col of Hourquette d'Aubert before descending to the lovely lakes of Aubert and Aumar. You can choose to stop here, leaving you plenty of time to stop and stare, or extend the walk in order to take in more lakes. We will then transfer you for a memorable night in the medieval perched village of Ainsa in Spain. The historic, atmospheric and charming two star Hôtel Siete Reyes is situated in the heart of this marvellously unspoilt village with its panoramic views over hills, mountains, and the lakes far below. The bedrooms have bare stone walls, but also a style that matches the quality of the cuisine. You won't forget it for all the best reasons. Walking time : 4h30 or 5h30. Ascent/descent : + 1050m / - 350 or 650m. Transfer: 40mins. 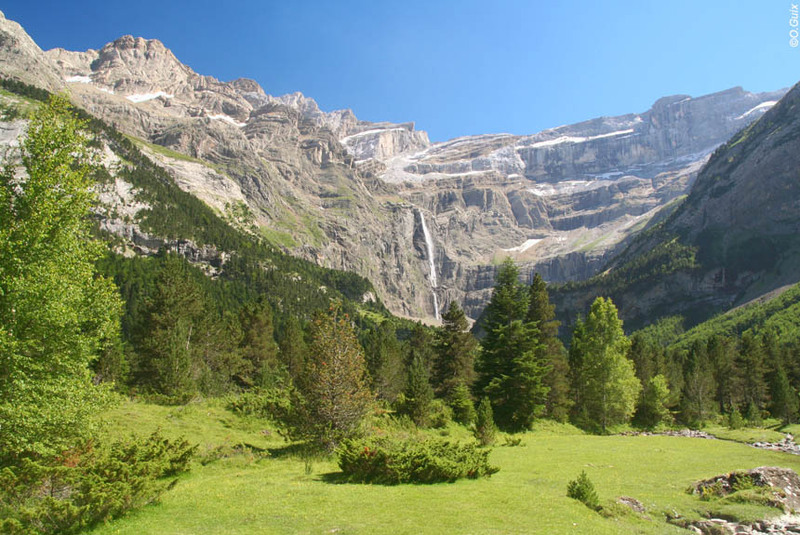 Today you take the small mountain bus to Nerin and up a dirt track from where you get some of the most impressive views of the immense Canyon of Ordesa, which gives its name to this marvellous National Park. You walk across cliff tops with spectacular views of the truly magnificent Mont Perdu (or Monte Perdido in Spanish) and down to a superb waterfall called the Cola del Caballo (the horse's tail). You can then follow the canyon through alpine pastures and forests, passing numerous waterfalls before being transferred to Torla, the gateway to the Ordesa canyon, and a lovely village. The smart but traditional two star Hôtel Bujaruelo is right at the heart of the village with unforgettable views, not least from the bedroom balconies, over a dramatic landscape dominated by Monte Perdido. The Spanish Pyrenees at its natural best many of us think. Walking time : 5h30. Ascent/descent : + 250m / - 1100m. Transfer : 1h15. Benasque valley. After breakfast, we transfer you to Benasque at the foot of the highest mountain in the Pyrenees, the 11,000 foot Aneto, but we're not expecting you to reach the summit! In fact, you can choose a spectacular route walking up to the Port de Venasque on the French-Spanish border, with panoramic views of Aneto and Maladeta and their extensive glaciers. Or you can take a less demanding, but still highly scenic, route on the alpine pastures of Aigualluts that passes one of the most famous sources of the Garonne river at the Forau d'Aigualluts, commonly known as the "Trou du Toro" for French speakers (literally the hole of the bull). You stay the night at the warmly welcoming, stone built mountain hotel located all by itself at the foot of Aneto, the three star Hôtel-Spa Hospital de Benasque with it great views, swimming pool, spa and very good restaurant. A well deserved experience. Walkign time : 5h30. Ascent/descent : + 300 or 850m / - 300 or 850m. Transfer : 2h. 49 lakes. That's all we can offer you today, a day spent ambling (joyously many people find) through the Spanish Pyrenean lakeland, the National Park of Aigues Tortes and Sant Maurici. You stroll on lovely footpaths alongside the grassy banks of these usually vibrantly blue lakes. You sit, you stare, you wonder about the miracles of nature and about how there can be so few people in such a magnificent landscape, and you take photograph after photograph. Well, that's our experience anyway. You end the day walking down through woods to the Sant Maurici lake which seems to reflect all the glorious mountain peaks that surround its deep, deep waters. The three star Hôtel-Spa Els Encantats combines a wonderfully unspoilt heart-of-the-mountains location with comfortable rooms with balconies, good food, and a spa, jacuzzi and gym (although more exercise may not be your priority). We transfer you to the Sierra de Cadi for a hike through hilly landscapes and high-altitude villages, from the village of Villec (Cava production) to Querforadat and Estena. Great mountain walls resembling the Canadian Rockies tower above these open landscapes just a stone's throw away from the region of Cerdagne. You could also take a quick out-and-back hike to visit the incredible Prat de Cadi, a wonderful clearing bringing you right up close to the cliffs. You stay in the Moli de Bramasacs at Villec, originally a 17th Century mill and now a remarkable country hotel. You have great views of the Sierra del Cadi, and the typical and tasty local country cuisine is excellent. Walking time : 4h or 6h30. Ascent/descent : + 400 or 800m / - 800 or 1200m. Transfer : 2h. We take you to the sunny high-altitude plateau of La Cerdagne, home of the highest villages in the Pyrenees. 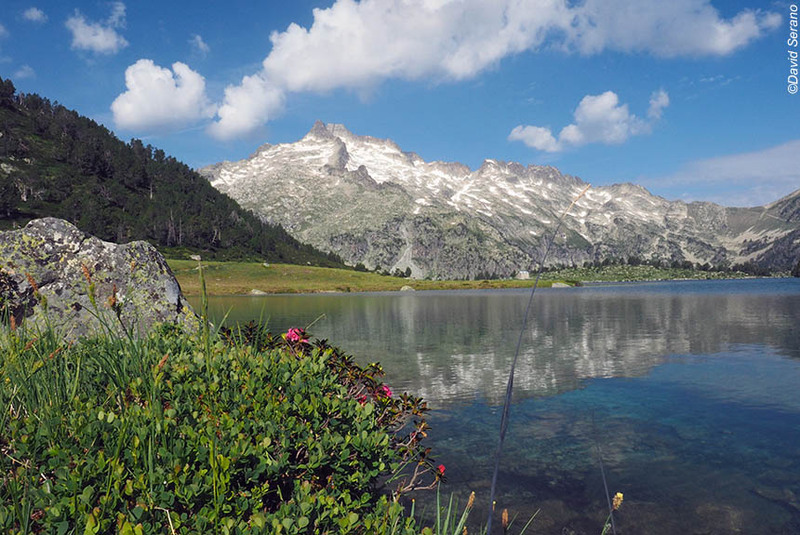 Starting from the Bouillouses lake, you will complete a great circular walk past dozens of other shimmering high mountain lakes of all sizes, with the summit of Carlit standing proudly over them at almost 3000m. Some of the lakes are surrounded by pine trees or flowering fields and others are pinned in by piles of multi-coloured boulders, their banks inviting you to come and relax, read a book or have a siesta. For the fitter among you, it is possible to hike to the top of Carlit, adding 550m of ascent onto your day. You will then be taken on to La Llagonne. While thoroughly contemporary in its facilities, the family run three star Hôtel Corrieu is located in the heart of the village of La Llagonne, and still retains much of the character of an authentic Pyrenean mountain hotel It now also offers a sun terrace, a spa zone, and panoramic views from its restaurant that is justly popular with locals. A great night is assured ! Walking time : 3h or 6h. Ascent/descent : + 350 or 900m / - 350 or 900m. Transfer : 2h. 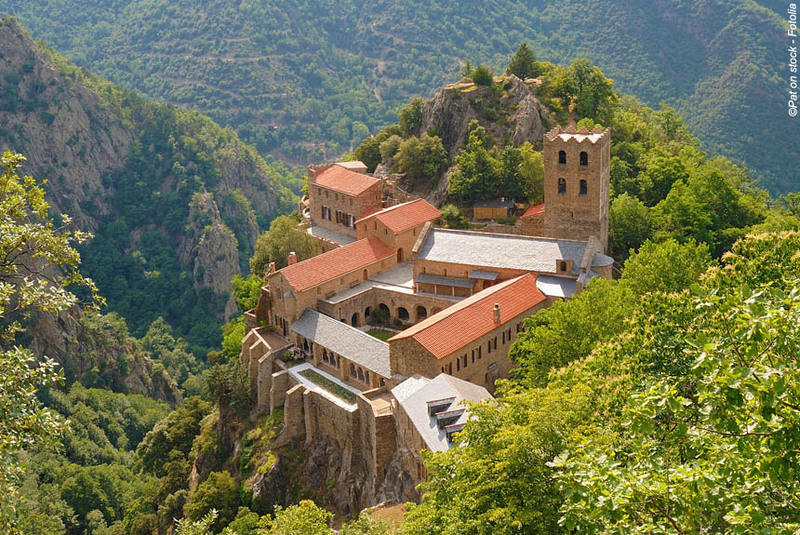 Today we take you to the 1,000 year old "eagle's nest" abbey of St Martin du Canigou impossibly located on a ridge with many of its buildings clinging vertiginously to sheer cliff faces. Its early Romanesque walls almost feel seeped in history and the countless lives of Benedictine monks "lost" in this most peaceful of locations. Before or after visiting the abbey, you can choose from severals more or less challenging walks through this warm and pleasant wooded landscape encouraging a certain amount of retrospection, perhaps appropriately as you near the end of your journey. En route to your hotel, you will see the magnificent Orgues d'Ille sur Tet - like organ pipes steepling up into the sky with a backdrop of the 9,000+ foot summit of Mount Canigou, also visible from the coast as you will see tomorrow. A luxurious four star hotel by a lake in the heart of the Mediterranean "garrigue" is a fair description of Hôtel Riberach, and its Michelin star restaurant located in an ancient winery, still with its huge wooden barrels, makes it all the more special. Walking time : 2h or 3h30. Ascent/descent : + 300 or 600m / - 300 or 600m. Transfer : 1h45. This morning we whisk you to the ancient fortified Mediterranean fishing port of Collioure, made more famous by being the haunt of artists like Braque, Matisse, Picasso and Charles Rennie Mackintosh - and the home for decades of author Patrick O'Brian (Master & Commander series of naval novels). You will have time to explore the museum, royal castle and back streets - some with artists' reproductions located exactly where they were painted. Then you can make the most of finally arriving on the Med by walking along its surprisingly undeveloped coastline passing tiny beaches with crystalline waters, often deserted, strolling around rocky and wild headlands as well as small working ports, or climbing up to the Madeloc tower and walking higher up through vineyards with magnificent Mediterranean panoramas. 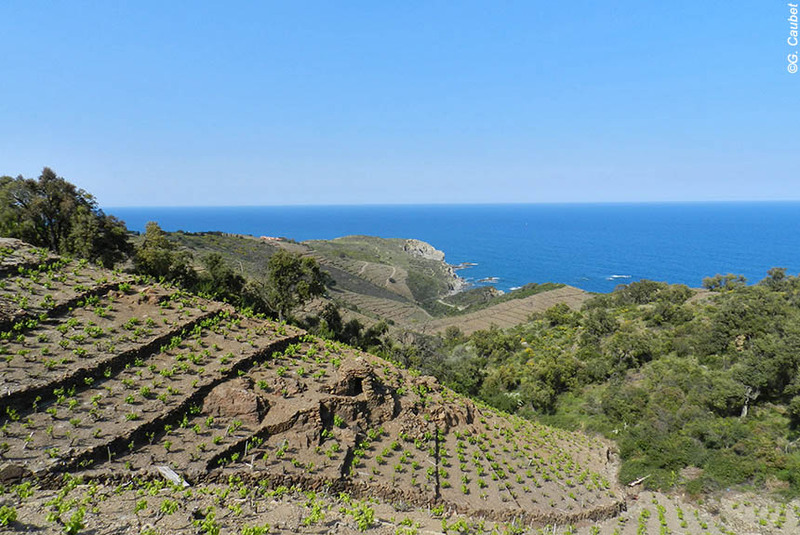 This is where the Pyrenees finally tumble down into the sea as you arrive at journey's end in Banyuls-sur-Mer. A riot of mixed emotions? Probably. A celebration drink? Certainly. Cheers! Suitably located right on the Med with a lovely beach in front, the elegant and determinedly contemporary three star Hôtel Les Elmes is a good place to spend your last night of the journey, or indeed any night, and we are sure you will have a great evening. Oh, and congratulations! Walking time : 4h15 or 5h. Ascent/descent : + 500 or 700m / - 500 or 700m. Transfer : 1h. After breakfast, we take you to the station or airport at Perpignan. Transfers to Toulouse, Montpellier, Girona or Barcelona also available (please consult us for prices). Transfering your luggage each day to the next accommodation is included in the price. This is an independent, self-guided holiday, but we provide comprehensive walking instructions. You stay in double/twin rooms with 2 nights in **** star hotels, 7 nights in *** hotels, 3 nights in good quality** hotels, one night in a * hotel in an exceptional location, and 2 nights in particularly characterful chambres d'hôtes. Dinner and breakfast are included on all but the first night, which is breakfast only. You can shop locally or order a pricnic from the hotel the night before, and pay locally. We provide you with comprehensive information about one month before departure including general walking advice, advice on travelling in France and Spain, equipment list, walking instructions including maps, and vouchers etc for hotels where required. If you ever have any queries, please call or email us. 14 nights dinner, bed and breakfast, one night bed and breakfast; transfers as described at the beginning and end of the holiday; daily luggage transfers; people transfers as described; comprehensive walking notes with maps marked to show the routels; 24/7 English speaking customer service. Lunches or picnics; dinner on the first night; entry to museums, galleries etc; the La Rhune train journey (15.50 Euros per person one way); the mountain bus on day 8 (4 or 5 Euros per person); personal insurance.